The Warriors have collected an impressive list of achievements and hold a record of 163 wins and only 44 losses over 16 years. The Warriors are proud of our members who have advanced to the next level. the NFL who joined the Warrior Family. 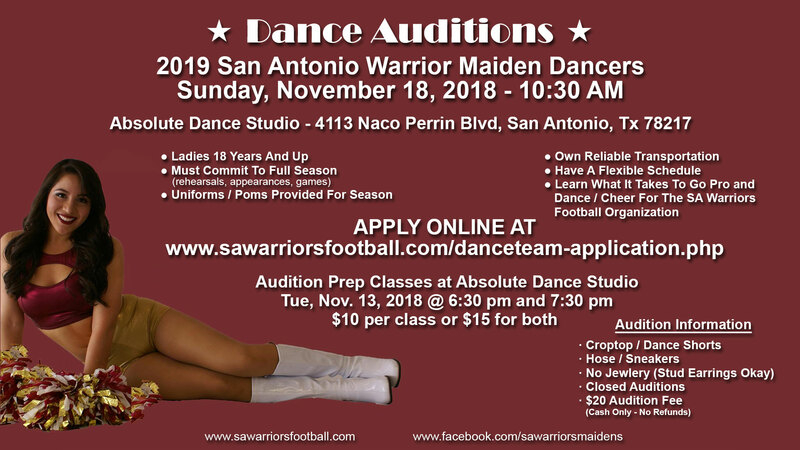 The San Antonio Warriors will hold a preseason game when they take on the West Texas Pride on January 26, 2019 at Matador Stadium in Seguin, TX. The Warrior's home stadium will be Matador Stadium in Seguin, TX for the 2019 season. Matador Stadium, 1315 E. Cedar St, Seguin, TX 78155. Saturday, May 21, 2016 the Warriors won their final game of the 2016 season against the Bell County Raiders. The final score was 32-12. It was an exciting game and will end the 2016 MPFL SA Warriors season on a positive note! We thank all involved and all our fans for coming out and supporting San Antonio football with the SA Warriors. We will be looking forward to all your support for the upcoming 2016-2017 season! Go Warriors! The San Antonio Warriors defeated the South Texas Crusaders during the 2015 Warriors "Toy Bowl" on Sunday December 6th at 5:00 pm being held at Wheatley Heights Sports Complex, 200 Noblewood Dr, San Antonio, TX. Come out and watch the San Antonio Warriors take on the South Texas Crusaders during the 2015 Warriors "Toy Bowl" on Sunday December 6th at 5:00 pm being held at Wheatley Heights Sports Complex, 200 Noblewood Dr, San Antonio, TX. Bring one new unwrapped toy per person as admission. All toys will benefit the Ronald McDonald House Charities of San Antonio. The San Antonio Warriors held their 2016 player contract signing at Harmon’s BBQ in Cibolo, Texas on November 1, 2015.